Born in Manila, National Artist Federico Aguilar Alcuaz (June 6, 1932 – February 2, 2011) was the sixth of eleven children and took his primary and secondary education at public schools. He pursued an Associate in Arts degree at San Beda College in the evenings and a Fine Arts degree at the University of the Philippines in the mornings. His professors at UP were National Artists Fernando Amorsolo (painting) and National Artist Guillermo Tolentino (sculpture) as well as other pillars of Philippine art namely Toribio Herrera, Ireneo Miranda, and Constancio Bernardo. Then Alcuaz went on to take up law at the Ateneo de Manila University from where he graduated in 1955. Then he decided to pursue art on a full time basis embarking on a stellar career and winning awards in major art competitions in the Philippines and abroad among them first prize at the 1953 UP Art Competition, first prize in the 1954 Annual Shell Art Competition and second place at the UP Art Competition, also in 1954. In 1955, he received a scholarship grant from the Spanish Ministry of Foreign Affairs to study at the Academia de Bellas Artes de San Fernando in Madrid then he later moved to Barcelona. In Spain, he won first prize at the Premio Moncada in 1957, the 1958 Prix Francisco Goya in Bracelona, first prize at the Pintura Sant Pol del Mar in 1961 and second prize at the Premio Vancell at the Fourth Biennial of Tarrasa in Barcelona in 1964. Recognition for his art extended beyond Spanish borders. In Paris, he was awarded the Diploma of Honor at the International Exhibition of Art Libre in 1961, the decoration of Arts, Letters and Sciences award from the French government 1964 and the Order of French Genius in 1964. In 2007, he was acknowledged by the Philippine government with the Presidential Medal of Merit award for his outstanding accomplishments in visual arts. Alcuaz’s works are included in the collection of some 20 museums and major cultural institutions in the world today including the Museum of Contemporary Art in Barcelona, the Museum of Contemporary Art in Madrid, the Gulvenkian Foundation Museum of London, the Museum of Modern Art of Warsaw, the Musem of Modern Art of Krakow, and the Philips Cultural Museum of the Netherlands. In his 55 year career Federico Aguilar Alcuaz has exhibited in leading galleries in Spain, the Philippines, Portugal, Poland, the United States and Germany. His exhibit “Federico Aguilar Alcuaz” in 2007, the first anniversary show of Galerie Joaquin Singapore, showcased rare pieces from the artist’s early works including 10 oil on canvas works and 10 of mixed media or watercolor. The artworks were sourced from collectors in Europe and the Alcuaz family collection, these being some of the best from the artist’s oeuvres. Several of them cover the period from the mid ’60s to the late ’70s, the period when some of the most exciting Alcuaz works were produced. Alcuaz’s works have also fetched record prices in auctions among them in the September 2007 Sotheby’s auction in Singapore and, most recently, the November 25, 2007 Christie’s auction in Hong Kong. Alcuaz’s “Tres Marias” sold at HK$ 271,000 (PHP 1,490,000), nine times above the minimum estimate while “Still Life with Landscape” sold at HK$ 112,500 (PHP 618,750), which is at 5 times its minimum estimate. Several Alcuaz paintings were featured in the definitive book on Alcuaz, “Parallel Texts” by Rod Paras Perez, which included rare watercolor pieces “Manila 1968″ and “Manila 1968 II” and other paintings on Wiesbaden, Germany. In 2009, the Republic of the Philippines through the National Commission on Culture and the Arts (NCCA) and the Cultural Center of the Philippines (CCP) bestowed upon Federico Aguilar Alcuaz (1932-2011) admission into the Order of National Artists. This titan of Philippine visual art was recognized for having influenced an entire generation of artists with a body of works that is critically lauded both here an abroad. 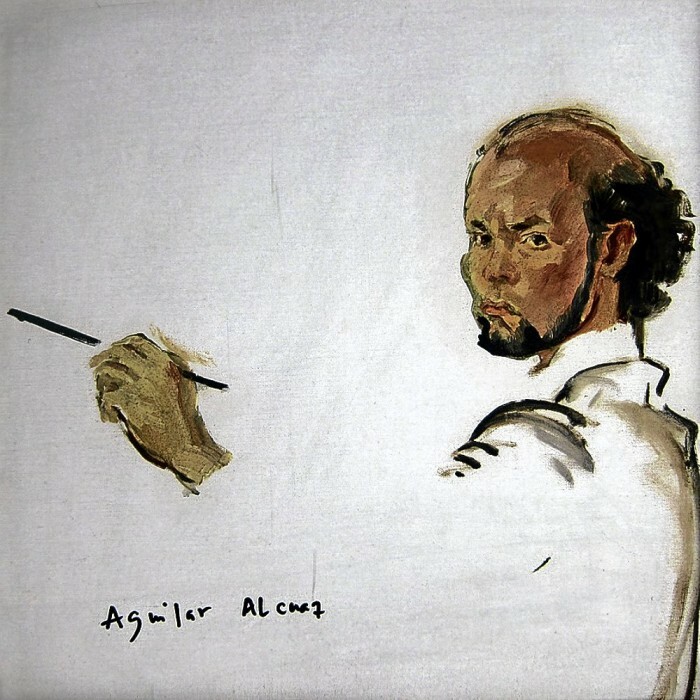 Aguilar Alcuaz had the soul of an artist, attaining the pinnacle of mainstream artistic achievement. His complex and nuanced personality – the music lover, the bon vivant, the astute observer of the world around him – has cemented his legend as an artist without peer. Since His untimely death early last February 2, 2011, His masterpieces have gained even more interest in this towering figure.